Aberlour Scotch Whisky Distillery current building opened in 1879 and was built by James Fleming. 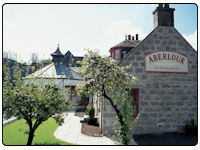 It produces all the Aberlour Single Malts. The distillery is in the heart of Speyside, Scotland leading whisky region where more than half of all Scottish whisky distillery are present. The distillery itself is suituated on the banks of Lour and Spey rivers. The visitor centre at Aberlour is an excellent visit and would recommend a visit there if you are in the area. They have small tour which started in 2009 around the distillery up to a maximum 16 people and this makes the whole experience a better one with such small groups involved. They also have tasting sessions on the tour and with the price only £10 per person it is a great day out with an average tour lasting just under two hours.